Welcome to the fifth monthly report for 2018! … Yes, I know, PulkoMandy usually does these. But he’s got WebKit fixes to do, and not much spare time, so this month at least he gets a break while I cover for him. Korli merged more ethernet drivers from FreeBSD 11 (broadcom440x/570x, marvell_yukon, syskonnect, rdc, nforce). Korli also made some fixes to the usb_audio (which is not included in the build), console drivers, and device_manager to make them work with SMAP, and fixed some bugs in the virtio disk layer. mount_server now has a better scoring mechanism to match volumes for automount, thanks to axeld. PulkoMandy and axeld fixed the locking-related KDL that was mentioned in last month’s progress report, as it had become too annoying for just about everyone to be tolerated. The modern GCC has been upgraded from version 5.4 to 7.3, thanks to the work of kallisti5, mt, korli, miqlas, and waddlesplash. mt had submitted a significant number of patches over the past few months fixing compile errors and new warnings on the new GCC, while kallisti5 spent some time doing the initial merge of our changes in buildtools. korli and miqlas contributed the new HaikuPorts recipes. waddlesplash finished the buildtools changes merge and made tweaks to all the rest of the work, and spent a few days tracking down a kernel crash on startup that occurred on builds made with the new GCC. The precise cause of the crash is still unknown, though it might be related to use of SSE registers. For now, the GCC optimization that causes it has been disabled on the problematic files, though eventually the true root cause of the problem should be found. No other major adverse effects of the switch have been reported thus far. With this out of the way, waddlesplash has turned his attention to working on porting the FreeBSD 11 WiFi stack, as he’s gotten tired of his laptop not having wireless support. kallisti5 did some more work this month on infrastructure, some of which is ongoing and behind-the-scenes (new buildbot setup…), but one piece of it is already live: package mirrors. There is no code in pkgman to handle mirrors automatically, so you will need to set them up manually by removing the default repositories and adding the mirrors. At present, the list of mirrors is stored in a mirrors.txt file alongside the repository information, e.g. here is the mirror file for HaikuPorts/x86_64. 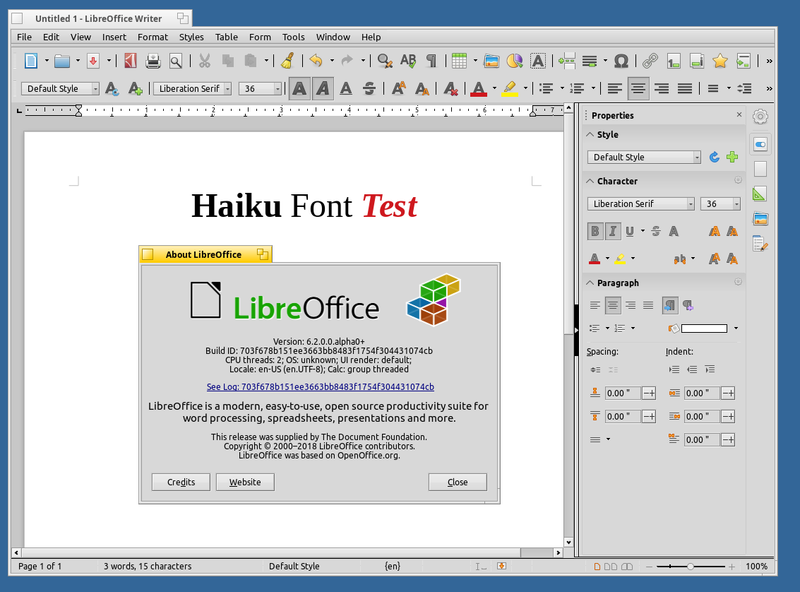 The big news this month, as forum posts and the title of this blog have already given away, is that LibreOffice has come to Haiku! There are still a few caveats and bugfixes still going on; for details see this forum thread. But it is entirely usable for day-to-day work. As of writing, it’s already in the x86_64 package repository, and hopefully coming soon to the 32-bit one. No, not yet… but there are only one or two infrastructural issues remaining, and the bug list is slowly but surely shrinking. We are closer than ever before, though, and the end is, I think, finally in sight. Patience.